Reading the report, I was surprised at how accurate my profile was. I scored particularly high in the S and C categories. According to the results, I have a tendency to "display great attention to detail" and have a "fierce devotion to accuracy". Under pressure, I am "likely to remain tactful and diplomatic". And it's true — I am a stickler for details and value my ability to think critically and see multiple points of views. However, with the good, came the bad: according to the report, people who scored high in S and C apparently had an inability to take charge and make difficult decisions, mostly as a result of analysis paralysis and the intense need to keep everybody happy. S personalities can be seen by others as meek and weak-willed, often times sacrificing their wants to maintain peace. Often times, they depend on others to call the shots and drive. Hm. Weak-willed and unable to make a decision? Yikes. I showed the test results to Erlend and asked him what he thought. He agreed with the assessment that I was very analytical, but was surprised that the report had labelled me patient and willing to sacrifice my wants for others. He pointed out my extreme annoyance for tardiness, and the multiple times I had snapped at my housemates for their constant messes around the house. Which got me thinking — the test was supposed to assess your behavior at work, and as my role in a fairly entry-level position, it wasn't my place to be calling any big shots or outwardly questioning my team leaders' choices. So of course the test had labelled me as, well, for lack of a better word, a bit subservient. But what about in my personal life? Would these results still hold true? Sure enough, when I started applying the test's findings to the rest of my life, I could already see a couple of its findings start to crumble. An inability to make decisions and take ownership, for instance, didn't make any sense. After all, it was a refusal to accept dissatisfaction in my various jobs that led me to move from San Francisco to Denver to Portland in less than 2 years. I've had friends stay at jobs that they are miserable in and are dissatisfied with for much longer because they're paralyzed by various 'what if' scenarios. Or what about the fact that I bought a house? Not a whole lot of 26 year olds would willingly invest in such a large venture by themselves. So by the time I finished comparing the test results to my personal life, I was left feeling supremely confused, a little emotional and frustrated. Why couldn't I apply some of my assertiveness in the context of work, and why couldn't I apply some of the patience and tactfulness I was known for at work to my personal life? I didn't know the answer to that question, but I knew it was time to bake. "I love that after a day when nothing is sure, and when I say 'nothing' I mean nothing, you can come home and absolutely know that if you add egg yolks to chocolate and sugar and milk, it will get thick. It's such a comfort." Indeed it is — like in the case of these malasadas. I'd been wanting to make Hawaiian donuts for some time now, ever since I saw a recipe in Lucky Peach magazine. However, it took me a long time to find time for the recipe since these donuts require a proofing time of FOUR HOURS. This long rise is what gives Hawaiian donuts their unique, rich flavor. It worked out for the best, in the end. Because after my introspection, four hours of baking is just what I needed. By the time these donuts were fresh out the fryer and rolled in cinnamon-sugar, I was no longer an emotional wreck and was happily popping donut after donut into my mouth. Because personality test, schmersonality test. Sure, I wasn't perfect, but I was pretty happy with who I am — and that's all that matters, right? Malasadas, despite being associated with Hawaii and known as Hawaiian donuts, are actually Portuguese in origin. They are like regular donuts and made from a similar type of enriched dough, but they lack the donut hole in the middle. Some are filled with custards and jams, but it's traditional to eat them unfilled and just rolled in sugar and spices. 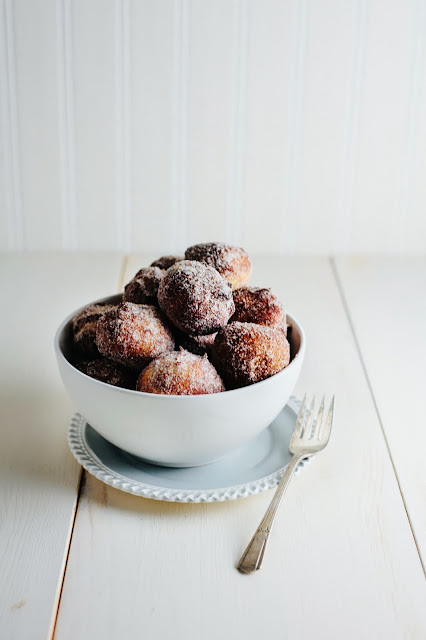 This recipe originates from Christina Tosi of Momofuku Milk Bar fame, who adapted it from the much beloved Leonard's Malasadas in Honolulu. Plan ahead for this one! Like I said, the donuts require a rising time of 4 hours total. Luckily, the majority of this time is inactive. You can go ahead and do other things like watch a movie or run a few errands since the dough is just rising. But it is essential that you let it rise for the right amount of time — again, its this long proofing period that distinguishes malasadas from your average donut. The long proof gives them a richer flavor and more buttery mouthfeel, as well as a lighter and airer texture. 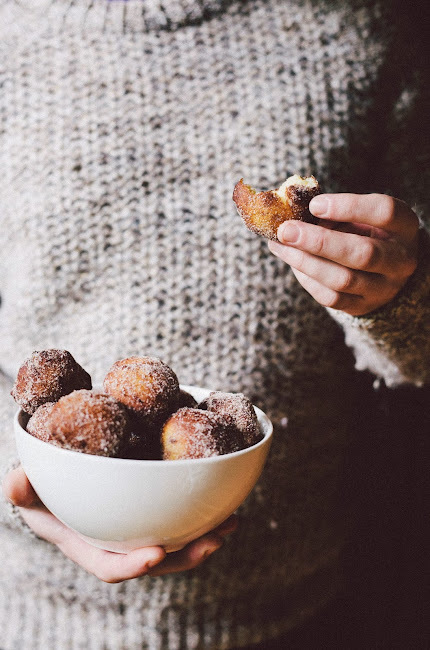 You don't need a deep-fryer to make donuts at home. Even though I have one, I prefer to use a Dutch oven or a cast iron skillet. I find it safer and easier to clean. It also really helps if you have a deep fry thermometer since it's almost shocking how hot the oil needs to be in order to deep fry things properly. Combine 2 1/2 teaspoons active dry yeast, 1 tablespoon sugar and 1/2 cup warm water in the bowl of a freestanding electric mixer. Whisk together until the yeast is dissolved, and then set the bowl aside for 5 minutes to let the sugar and yeast start working together. In a medium bowl, combine together 2 1/4 cups bread flour, 1/2 cup nonfat milk powder and 1 teaspoon kosher salt. Set aside. In the bowl of a liquid measuring cup, gently whisk together 2 large eggs, 1 teaspoon vanilla extract and 1 teaspoon white vinegar until homogenous. Set aside. Fix the freestanding electric mixer with a dough hook and add half the dry ingredients to the yeast and water in the mixer bowl. Mix on the mixer's slowest setting for a minute or two, just until the ingredients have started to come together. Add half the wet ingredients before mixing for another minute or two, just until they've started to be absorbed into the dough. Repeat with the remaining dry, then wet ingredients. Finally, add 1 tablespoon unsalted butter into the dough. The dough will be almost rebelliously wet — wetter than your average brioche dough — and that's the way you want it. Continue mixing for another 8 minutes on speed 1 until the dough is smooth. Once the dough is smooth, transfer to a lightly greased medium bowl, cover with a flour cloth and place in a warm, draft-free, dark spot (like an off oven) for 2 hours. After 2 hours, turn the dough out into your lightly floured work space. With clean, slightly wet hands, pinch off golf-ball sized pieces of wet dough with your first finger and thumb. Smooth out each dough ball in your hands or in the counter, creating a ball shape by grabbing one side of the dough and then folding it over the top to the other side of the dough. Be sure to stretch each dough segment only to the point of resistance, before folding them across the entire length of the dough mass. Transfer to a greased baking sheet, leaving about 2 inches between each ball. When all the dough has been balled, spray with a faint mist of cooking spray and cover loosely with plastic wrap, before leaving out on the counter to rise for another 2 hours. After the dough has risen for another 2 hours, pull out your deep-fryer or a heavy bottomed pan like a Dutch oven or cast iron skillet. Heat around 4 to 6 cups of vegetable oil to 400 (F). 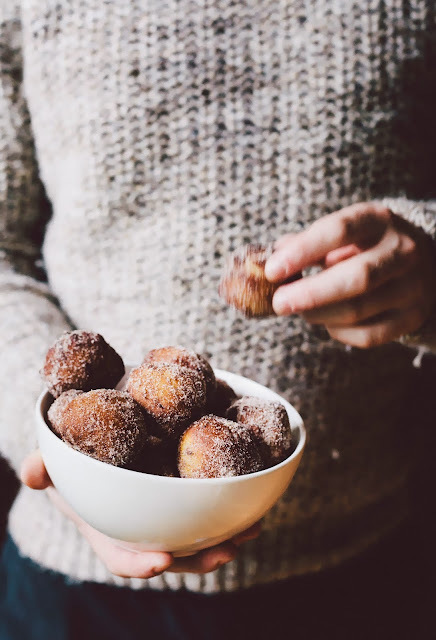 While the oil is warming up, make the cinnamon sugar topping: in a medium bowl, combine 1 cup granulated sugar, 1/4 cup light brown sugar, 1 tablespoon ground cinnamon and 1 teaspoon kosher salt. Whisk together until well combined, before setting aside. Once the oil is ready, use a perforated spoon to gently pick up a proofed dough ball and slowly lower it into the hot oil. Submerge and flip the dough as it slowly browns. At 400 (F), the dough balls should take 1-2 minutes to fry all the way through. Use the same perforated spoon to pull the malasadas out of the oil. Transfer to a wire rack lined with paper towels to soak up any excess grease. 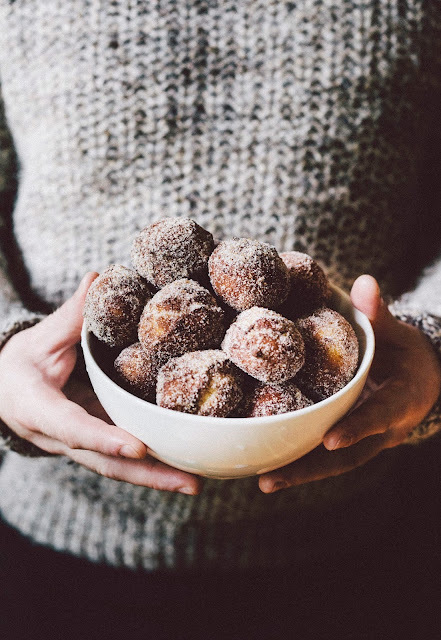 Allow the malasadas to cool and drain for a minute, then, while they're still hot, transfer them one by one into the bowl of cinnamon sugar and toss until completely coated. Allow the malasadas to rest for a few more minutes before serving/eating — if you rush this, the malasadas will be doughy and underdone in the center. But be sure to eat while warm since they are best on the day they are made. These donuts look delicious. When I am too stressed I usually clean my flat to calm down. Big thoughts always need donuts. I find it weird how we can have two such different selves - 'work me' and 'life me' - and it can be so difficult to reconcile those into the same person. I soo need to make donuts soonish. These look delicious! I wanna dive right into that bowl of donuts - yum!! Michelle, I noticed that I often take different roles in different situations. I usually don't like to be in charge, but if I'm in a group that nobody is suited for it, I will do it. One psychologist said to me it's totally ok, we are not always the same, as you notice you at work and you in the kitchen it's not the same. 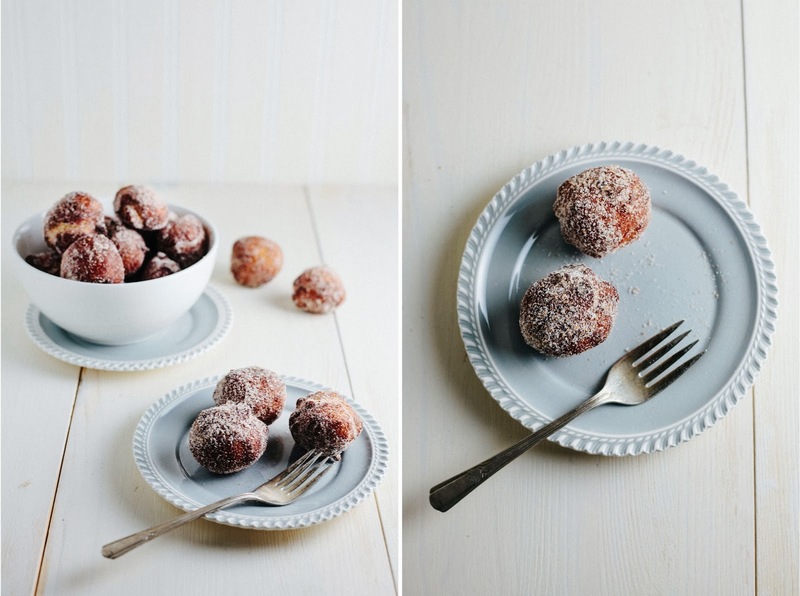 I hope to make some kind of doughnuts next week, I hope it will work miracles for my soul as well. This is amazing! I only just found out about malasadas today when researching Hawaii and then i stumble upon your blog and see this recipe! I just have to make these! !